High Quality Ceramic Conical Burr construction ensures a precise and consistent grind every time. - Built-in Adjustable Grind Selector gives you precise control over the coarseness of your grind. 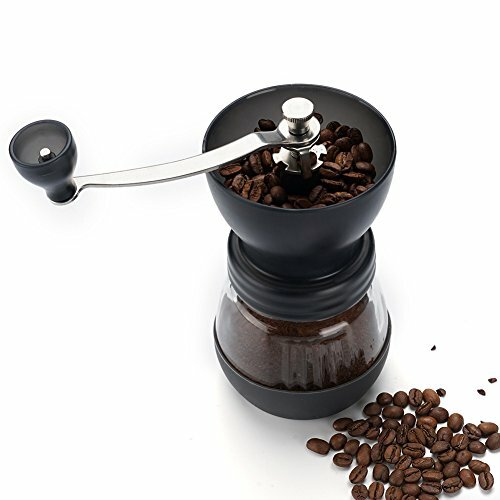 - Handy rubber top keeps your beans from spilling out of the hopper while you grind. - Comes apart easily, so it's a snap to clean. - Removable Silicone Base for easy cleaning. - No batteries or electricity are required so you can enjoy fresh ground coffee anywhere, even while camping deep in the woods! WELLMON's Easy to Use, Hand Crank Coffee Mill makes far less noise than electric grinders, which means you can enjoy the freshest ground coffee while your loved ones are asleep or in the office. In addition, our precision grinder is Perfect for Grinding Pepper or your Favorite Spices! We'll go the extra mile to make sure you love our products as much as we do. We love hearing from you and if you contact us, you'll hear back from our founder directly. If you don't like any of our products for ANY reason, you're always covered by our 100% Money Back Guarantee and Lifetime No Questions Asked Warranty! LIFETIME, SUPER SIMPLE GUARANTEE AND WARRANTY - If you don't like our Manual Coffee Bean Grinder at any time for any reason, will will give you your money back immediately. We stand behind all of our products without reservation, and we use them in our home every day. If you have any questions about this product by WELLMON, contact us by completing and submitting the form below. If you are looking for a specif part number, please include it with your message.